Environmental Air Technology is a stocking distributor for Tridim™ Filter Corporation, Smith Filter, TVS Filters, Micro-Air clean air systems and many more. We can source practically every commercial and industrial air filtration product available. We stock in our Omaha warehouse Tridek™ self-sealing panel and link air filters, Tri-Pleat™ extended surface pleats, Synthetic and fiberglass V-bags, high efficiency cells, bulk and panel charcoal filters, HEPAs, washable metal mesh and baffle filters. (Galvanized, aluminum, and stainless steel). Environmental elements make air intake filtration a challenge. Out of sight, out of mind maintenance practices are something every rooftop unit falls prey to, causing a major headache or high cost repair for building management. Every piece of equipment, large or small, stationary or mobile, indoors or outdoors, needs preventative maintenance and air intake screen protection. We offer filter material that can prevent the coils from becoming impacted, prolong the life of the coils as well as help maintain the units efficiency. 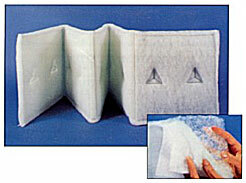 Made of permanent, washable synthetic fabric media, which draws in and traps airborne particulates. PreVent air intake screens are available with either electrostatic polypropylene media or a heavy-duty PVC coated polyester high abrasion media. Enhanced by airflow and custom fit, our air filters need no electrical connection or system modifications. PreVent air filters for intakes will not restrict air flow to the equipment. 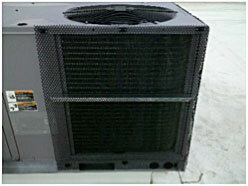 Permatron HailStop Hail Guard PVC netting protects your investment in HVAC equipment. Designed to deflect airborne objects and protect delicate fins, Permatron’s HailStop is easy to mount across the any type of equipment air intake fins. In addition, it can be layered behind PreVent Equipment Protection filters for protection of airborne debris from dust particles to large hailstones.